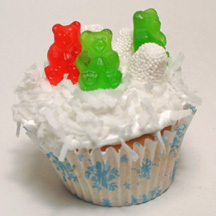 Sure, teddy bears love their picnic cupcakes, but did you know they also like to party in winter? What You Need: 1 cupcake; white frosting; coconut; red and green gummi bears, white gumdrops or spice drops covered with white non-pareils. How to Make It: Frost cupcake. Sprinkle with coconut. Add gummi bears and “snow drift” gumdrops. This entry was posted on Monday, December 15th, 2008 at 1:05 pm	and is filed under animal cupcakes, Christmas cupcakes, fantasy and magic cupcakes, winter cupcakes. You can follow any responses to this entry through the RSS 2.0 feed. Responses are currently closed, but you can trackback from your own site.